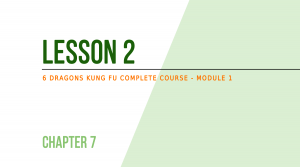 Lesson 4 – Why choose to practice Kung Fu? This way each of us become an expert in his personal 6 Dragons Kung Fu Style. This way we can truly be all different and express ourselves at our maximum level. Is it possible to learn a martial art online? Everyone has an opinion about learning martial arts online, from a book or from a video (read Online learning and martial arts: is it possible?) but the only way to know the answer, dear friend, is to try. There are very few things that determination (discipline), reason (preparation) and dedition (concentration) cannot do, but, if you think that these 3 things have to come from a teacher, you will never learn anything, even at the Shaolin Temple. The only certain thing is that without fighting and / or without partners (at least periodically) we lose the concept of “martial art” both in a gym, both everywhere (read How to use martial arts in a real fight). 6DKF do not force practitioners to do sparring, it forces them to be realistic, to understand that theory, in a real self-defense situation (or in a sport competition), is completely useless without practice. Understood this, can it be a good choice of life to do not fight with anyone and to use Kung Fu as a way to discover yourself. The discriminant is awareness. 10 things that change for 6DKF’s practitioners (physical) – An example of 10 things that, physically, change in the life of a practitioner. 12 Things That change for 6DKF’s practitioners (mental) – An example of 12 things that, mentally, change in the life of a practitioner. We have various kind of sparring, with different levels of interactions, intensity and goals. Do not worry about physical contact, you will be gradually prepared to this and at the end you will find it a completely normal activity. In our meaning, during training / sparring there is no winner or loser, we are not enemies / adversaries, we are friends working together to grow, to test, to experiment without competition and without the idea to prevail or worst to cause damage. The best way to fight (as Masaaki Hatsumi teaches) is taking it as a game, in a relaxed manner. Hello, I am Yan Lei from China, what about spaces for training and training tools? How can I find training partners?